Our new governor, J.B. Pritzker, has made it very clear that he would like to see Illinois adopt a graduated income tax to replace our current flat tax structure. The required amendment to our State Constitution will require approval by the voters at the election in 2020, assuming it will have support from the General Assembly in Springfield during this session. Possible tax brackets have also been published. And what about broadening the scope of our sales taxes to include more services? All of these proposals are on the table! What we want to hear is your voice! 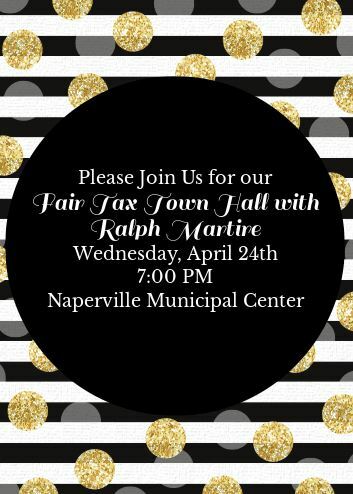 Ralph Martire, Executive Director of the Center for Tax and Budget Accountability, a bi-partisan organization dedicated to ensuring that all public fiscal policies are fair and just and promote opportunity for all, will be our speaker! He was most recently appointed to serve on the governor’s transition team. We are honored to have him as a spokesperson from the Responsible Budget Coalition to help break it all down for us and to take your questions! So, let’s become better informed together on April 24th!